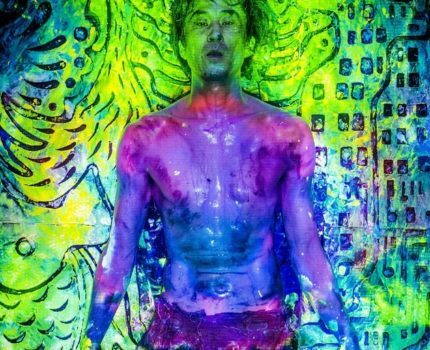 The Japanese avant-garde collective Eggore and the painter-performer Tesshu present an energetic live painting and music performance to delve into an ancient future: a sense of the world as it once was, and one day may be. Inspired by the Japanese contemporary dance tradition of butoh, Eggore explore a range of human emotions and a sense of common humanity through dance-painting performance. 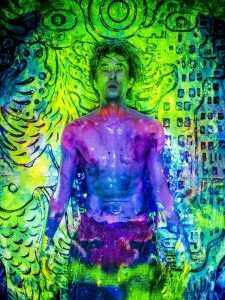 In complete darkness, a meandering beat and mesmerizing sounds accompany the gradual emergence of the painting, drawing us into a world beyond: neriya kanaya, a realm known to the inhabitants of some of the southernmost islands of Japan. Thus a story unfolds in front of the eyes of spectators, revealing a sense of connection and ceaseless flow, building bridges between the past and the future, binding together an ancient human passion for storytelling and contemporary forms of expression.